If you run a website with multiple RSS feeds it an be awkward to manage each feed individually. To make a feed successful, you need to get people to subscribe to the feed. Also, if you set up feed email notifications (there are many third party applications that do this, such as FeedBurner) then it is better to have all feeds combined. You cannot expect readers to sign up to every feed on your site. Luckily Yahoo provide an excellent solution to this problem, with their Yahoo Pipes (beta) product. 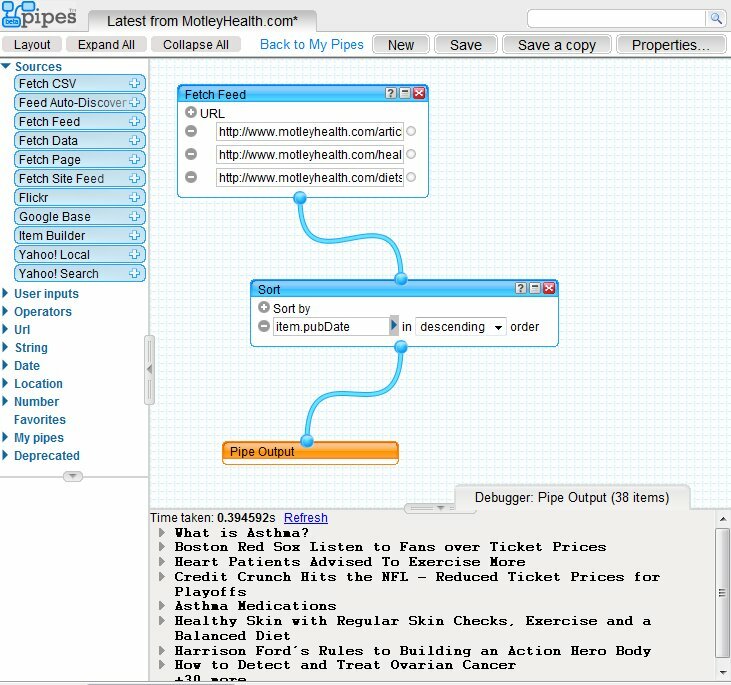 Yahoo Pipes is free to use, you just need a Yahoo! account. Although it is a relatively complex piece of software, it is actually very easy to set up a basic amalgamated feed. You can obviously add any feed you like to the Pipes, to create your own “superfeed” from your favourite websites. However the focus here is for Webmasters to learn how create an aggregated site feed. Drag the “Fetch Feed” source to the work area. Paste in your feed URLs, adding extra URLs with the top left button. In the example below, three separate blogs one one domain are being aggregated to provide one feed. Add the Sort filter from the Operators (third menu item down). Chose item publication date, descending order. The Pipe Output will already be in the work area. To “pipe” the feeds, simply click on the button on the bottom of the Fetch Feed, and drag the cursor to the top of the Sort box. Then connect the Sort to the Pipe Output in the same way. Click Run Pipe (top middle, not in screenshot) and this will take you to your Pipe management page. In Pipe Management you can chose to publish the feed, and also set up the RSS URL, under the More Options Menu. You can also specify a URL for the Pipe Page, e.g. http://pipes.yahoo.com/motleyhealth/latest which is (was) the MotleyHealth.com aggregated feed. In addition to providing the RSS, Yahoo Pipes allows you to embed a feed into a website by using the “Get as a Badge“. Here is an example of the Yahoo Pipes Badge embedded on a page. (Update – this seems to not work 100% of the time, will need to monitor, Not noticed any down time for the RSS itself, only the Yahoo Pipes Badge). There is a lot more to Yahoo Pipes than explained here, but this should provide a start for anyone wanting to publish a group of feeds together. Once the RSS URL is obtained, this can then be used with FeedBurner to great HTML feeds for websites, or set up email subscription services, and a whole lot of other things.